These Marcona Almonds are fried and slightly salted; they are Spain's most precious almonds. 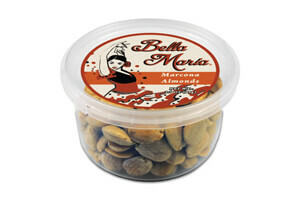 The Marcona almond is rounder, shorter, and sweeter than the California almond and they are absolutely delicious. These 'Queen of Almonds' are a great snack and wonderful in combination with cheese or chopped in your salad. Also try them in your bakery recipes. Once you've tried these gourmet almonds, you will continue enjoying them.